We’ve packed out the ExCeL London today for Blue Prism World London 2019 – our annual tech and automation conference. And Day One has already started with a bang! We secured some amazing speakers for our keynote sessions – and the ideas, insights and automation knowledge have been coming thick and fast in today’s presentations. Martha Lane Fox, Baroness Lane-Fox of Soho, CBE, kicked off our keynote sessions in style with her take on the future of digital technology – and the need for a fairer kind of internet. We had some great insights from Dave Moss, our CTO and co-founder, into the next generation of Blue Prism product features and updates, and how Blue Prism provides the foundations for a more connected and scalable kind of digital future. It was also great to hear from our valued partners and customers, with Royal Bank of Canada, Fidelity and Banca Intesa Sanpaolo all giving us their unique take on how Blue Prism’s connected-RPA has transformed the automation, efficiency and productivity of their businesses. Our annual Excellence in Enterprise Awards take place at 6pm in the main auditorium – so please do come down to applaud the successes of our nominees and winners. The winners will be selected from a panel of thought-leaders and influencers within the industry, with a range of awards that show the true diversity and impact of RPA. Day One of Blue Prism World London will wrap up after the awards with some time to relax, grab a beverage and let your hair down at our party. Come down to the Partner Village for food, drink and music from renowned DJ, Guy Preston. Guy’s blend of uptempo club hits and live musicians has seen him play shows for Chanel, British Vogue and a host of celebrity names – so we’re sure to see some shapes being thrown on the dancefloor. 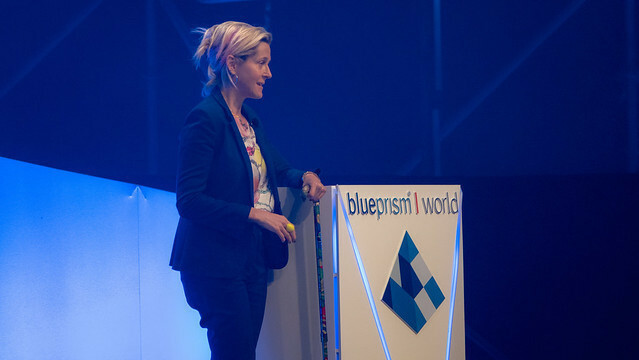 Blue Prism World is all about sharing ideas and connecting with people – so we want you to get the absolute best from these two days of automation excellence. Download the app – if you haven’t already, go to the Apple App Store or Google Play App Store to download the Blue Prism World app – with all the information you need to navigate the show and find the best sessions, exhibitors and stands for you. Check the Agenda – view the app, or go to our online Agenda, and plan out your customer track sessions and presentations for Day Two. Visit the Partner Village – to check out the Blue Prism Partner community and explore the stands, demos and automation experts in our partner area. Meet up at the seating zones – we have seating zones dotted around the auditorium, so why not meet up with a partner, catch up with a colleague or just take some time out to grab a drink or some refreshments. We’ll have lots more insight into connected-RPA, Intelligent Automation and digital transformation for you tomorrow. So enjoy the rest of Day One and we’ll see you at 8.00am tomorrow for registration and breakfast.